If memory serves me well it was at the Riviera Hotel that my parents deposited their two teenage daughters for a few days while they enjoyed shows like “Funny Girl” and performances by Wayne Newton, Liberace, Shecky Greene, Don Rickles (and who knows who?—we stayed in our room), some candlelit dining and perhaps a bit of blackjack or poker. That was back in the 60s when Vegas from a distance was nothing but a sliver of a mirage set in the midst of a bleak and barren landscape. The parents were actually entertaining the thought of moving the family from Southern California to Sin City. After spending two days in lockdown in a two-bit town (subjective view) that catered only to adults, the teenagers went postal: the family ended up moving to Southern Oregon instead. Two decades later in the early 80s, I voluntarily moved to Las Vegas and embraced it. Two decades after that the 60-year-old Riviera is scheduled for implosion on May 5, 2015. Like most long-time Vegas residents ‘The Riv’ has in its time been under the control of Mafia related “bosses”: Mayor—I mean MEYER Lanksy for one. She’s undergone a number of facelifts and cosmetic enhancements such as: added the 24-story Monaco Tower costing $28 million in 1988, and in 1990 ‘The Riv’ became one of the largest casinos in the world by expanding the casino floor area 70,000 square feet to reach a total of 125,000 square feet. 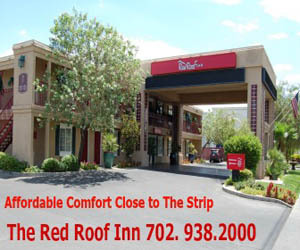 In February the Vegas landmark was sold to the Las Vegas Convention and Visitors Authority for close to $191 million. 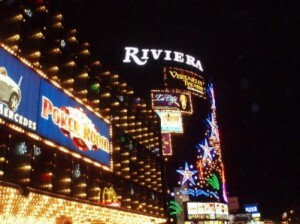 The Riviera will celebrate its sixtieth anniversary on April 20. One might surmise this event won’t be anywhere near the lavish debut of the Riviera in 1955 that was considered the grandest opening to date: how can you replicate Liberace performing in the Clover Showroom with actress Joan Crawford serving as official hostess? Perhaps Britney Spears, the Kardashians and Justin Bieber will be invited to participate in this final event.